Government of Punjab in Pakistan recently launches a short messaging service (SMS) based price information system. Through this service Pakistani citizens can get the daily updated prices of grocery items on their cell phones. The service is launched to keep the market prices according to the price list issued by Government of Punjab. You will immediately get the price list issued by government of Punjab. This service is launched in all districts of Punjab. SMS to 80024 costs Rs. 1.43 including Tax. Atta Bag (20 Kg): 785 Rs. Vegetable Ghee (Kg): 161 Rs. Rice Basmati (Kg): 145 Rs. Rice Irri (Kg): 48 Rs. Gram Pulse (Kg): 65 Rs. Chicken Meat (Kg): 276 Rs. Sugar White (Kg): 52 Rs. Eggs Farmi (Dozen): 94 Rs. Milk Liter (Loose): 70 Rs. Red Chilies (Kg): 170 Rs. Roti Tandori (100 gm): 6 Rs. Lady Finger (Kg): 130 Rs. Bitter Ground (Kg): 130 Rs. Green Peas (Kg): 44 Rs. 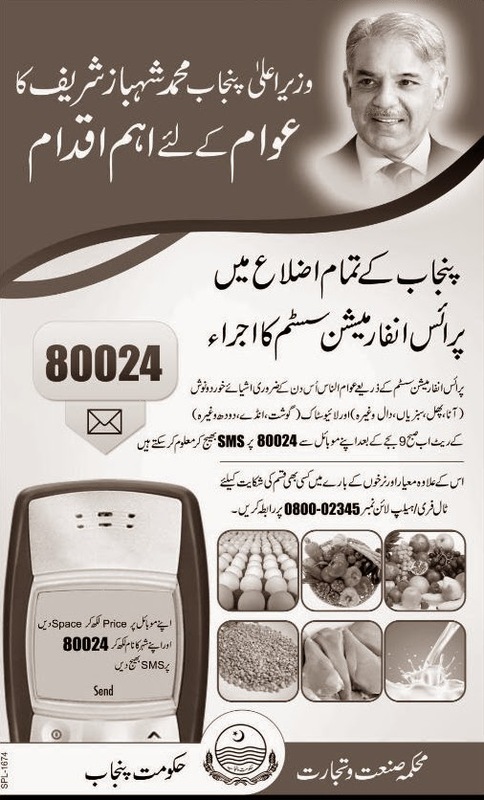 People can get daily updated market prices of these 36 items on their mobile phones through Punjab Price Information System by just sending a SMS to 80024.